Bring your classroom to life with your rug! Bring the outdoors in and expose young minds to all the wonders of the world. These Natures's Beauty Seating Squares showcase some of nature’s simplest wonders. The environment comes to life for students in a whole new way! 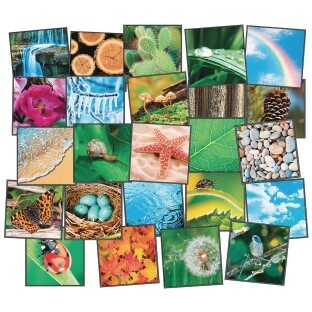 These innovative PhotoFun™ rugs use vivid photographic images and will enhance visual learning for all children regardless of language, speech or hearing abilities. They can be used with a classroom seating carpet or alone as seating squares. Each square measures 16” x 16”. Sold as a set of 24 and comes with a Stow-N-Go Tote. All flagship carpets are made in the USA from 100% nylon and meet or exceed Class One Fire Rating. The carpets have Scotchgard™ and protect against odor, mildew, mold, stains, and static shock. Carpets squares are Green Label Plus certified and exceed the California indoor air quality standards for low-emitting products used in schools. All rugs come with a useful life wear warranty.